When I photographed this tankard at the 1999 auction where it sold for $450, it was listed as previously unreported and named Clovers. Glen Thistlewood has informed me that this enameled pattern is called Windflower (though incorrectly listed in another source as Wildflower). She and Steve have had a complete set in the pattern. A marigold tumbler listed as Windflower sold in 1998 for $35 and a pitcher, marigold to clear at the base, sold in 2003 for $500. 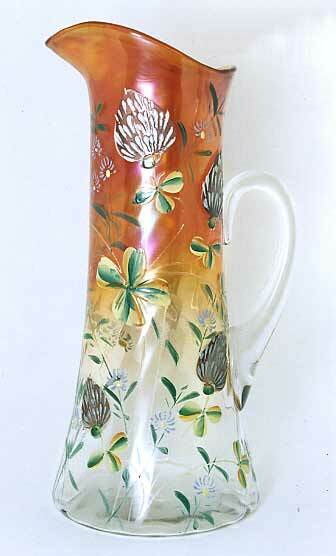 Another marigold tumbler in the Windflower pattern sold in 2002 for $65. In 2006, a 7-piece water set in marigold sold for $265 and in 2009 a marigold pitcher brought $525. In 2014 a marigold pitcher listed as Windflower sold for $225. In 2017 another marigold pitcher brought $800.